Current Raith Rovers goalkeeper Robbie Thomson is the son of Coca-Cola Cup winner Scott Thomson. As Robbie Thomson watched his dad get inducted into the Raith Rovers Hall of Fame on Monday night, it only made the young goalkeeper all the more determined to follow in his footsteps. Scott Thomson took centre stage at the sold-out Adam Smith Theatre, alongside fellow inductees Chris Candlish, Keith Wright, Tony Rougier, Ian Porterfield and current assistant manager Paul Smith. As the man who made the most important save in Raith’s history, stopping Paul McStay’s penalty to win the Coca-Cola Cup in 1994, Thomson Snr’s story needs no introduction. It would be a dream scenario for the family if Robbie could follow his father into the Hall of Fame one day, but for now, the focus is simply on securing promotion from League One. “It was a brilliant night,” Robbie said. “Everyone knows my dad’s story and just seeing it again makes you realise how much of an amazing achievement it was. “I was absolutely delighted for him, and he was delighted as well. “It was great to see a smile on his face because he works really hard and deserves it. “Everyone has got their own path, and I’m focusing on trying to get Raith out this league, then hopefully we’ll get rewards one day, and maybe get a good cup run like that. After an injury-hit start to the season that saw Thomson lose the gloves to Rangers loanee Kieran Wright, the 25-year-old is now enjoying the responsibility of being the club’s first choice ‘keeper. “That was one of the reasons I wanted to come to Raith to try and get games in,” he said. “It’s always the best thing when you’re training all week and getting a game on Saturday. “I know how much of a privileged position that is. 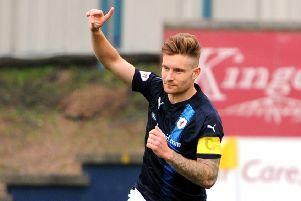 Thomson was one of few Raith players to emerge from the second half of Saturday’s Fife derby with credit as East Fife overturned a half-time deficit to win 2-1. “It’s disappointing when you contribute a couple of saves but end up getting beat,” he said. “Those saves don’t really count for anything now. “It’s been great since the new manager came in and all the boys love him. “He’s great to work under, and we work really hard. With 23 games still to play, Thomson believes there is enough time left to overturn the 10-point gap to league leaders Arbroath. “Obviously we’d rather be in their position, but it’s now up to them to maintain it because we’ll be grafting away every single week to make sure we claw that back,” he said.